We are having a few days holiday in the Lleyn Peninsula in NW Wales. 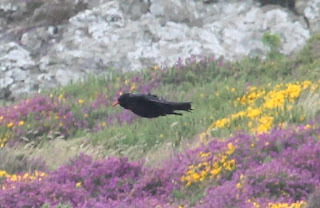 On Wednesday we drove right down to the tip of the peninsula to see if we could see the Choughs which are resident there. The wind was very strong so we didn't linger outside the car but we did see a group of three in the distance. I managed to get a distant shot of one of them and though it isn't particularly sharp you can see the distinctive curved red bill and just a hint of red leg. We were also very interested to see the gorse bushes which only grow about 25cm high because of the constant strong salt laden wind.